Here’s an amazing feature of cheese that doesn’t get enough coverage: When it gets hot, it melts. We know this. But if you keep heating it up, it eventually gets crunchy. It’s not burned, it’s just right. A lot of fancy restaurants will bake Parmesan and make little Parm crackers that they use to top salads. It turns out you can use the same method except on an entire sandwich. Not only did it work, but it freakin‘ worked! 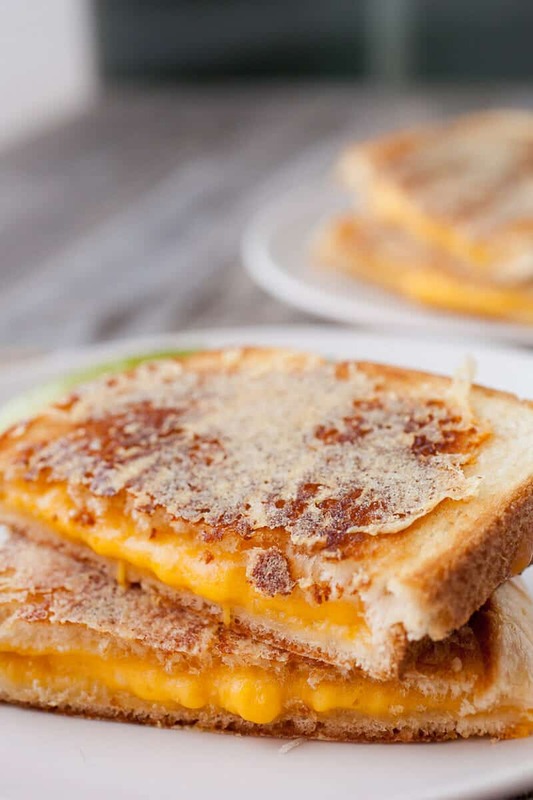 A classic grilled cheese (with cheddar) made into an inside out grilled cheese by topping it with parmesan and crisping it up! 1) Grate cheeses and use a microplane to great Parmesan very fine. 2) Lightly butter two pieces of bread. 3) Add one piece of bread butter side down to a nonstick pan. Top with grated cheddar cheese. Top with second piece of bread, butter side up. 4) Cook over medium heat for about 3-4 minutes per side until bread is browned and cheese is almost melted. 5) Remove from heat. Very lightly butter each side of the sandwich again and top with two tablespoons of grated Parmesan. 6) Add pan back to heat and cook for another 1-2 minutes over medium-high heat to melt and brown the parmesan cheese, making it crispy. 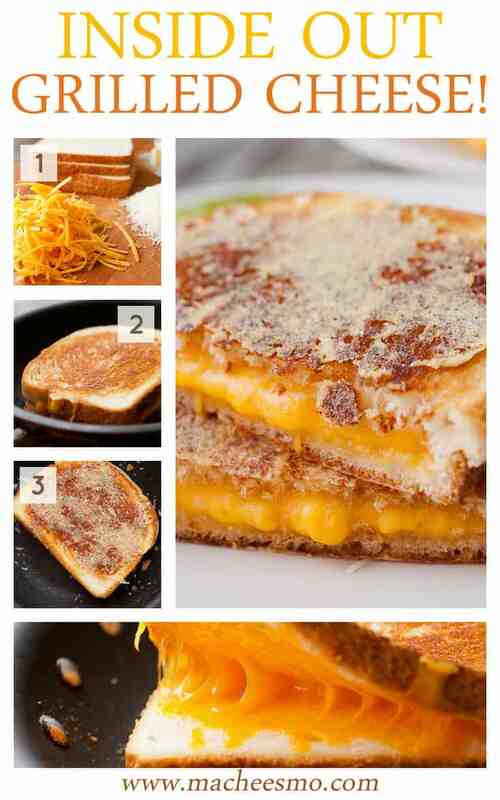 7) Once cheddar cheese is melted completely and parm is browned and crispy, remove sandwich and serve immediately! I’m a big fan of the grilled cheese. It’s quick to make, you almost certainly have everything you need for it in your fridge, and it’s just plain delicious. I still make them for lunch regularly, but also Betsy and I will have them for dinner occasionally with soup or a salad. While you can get super-fancy with fillings, all you really need is butter, bread, and cheese (two kinds ideally)! 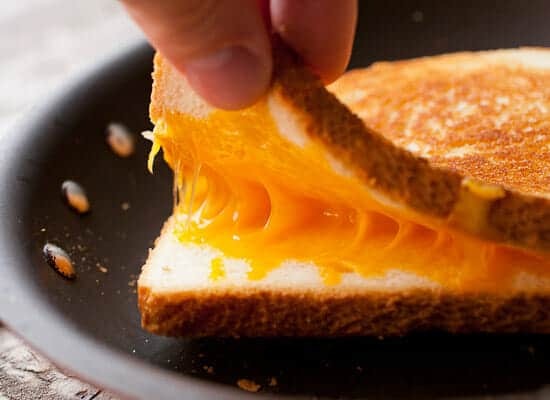 The tricky part about grilled cheese is making sure your cheese is melted while making sure that your bread isn’t burned. To make it a bit easier to melt the cheese, I recommend grating it instead of just slicing it. It will melt in about half the time if you grate it. 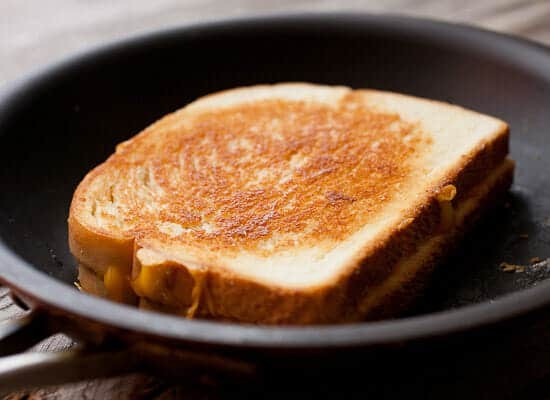 For the basic grilled cheese, lightly butter each piece of bread. Place the bread down in a nice nonstick pan and then top with cheese and follow it with the second piece of bread. Cook this sucker on medium heat for about 3-4 minutes per side. That should give you a nice melted center and perfectly toasted bread. 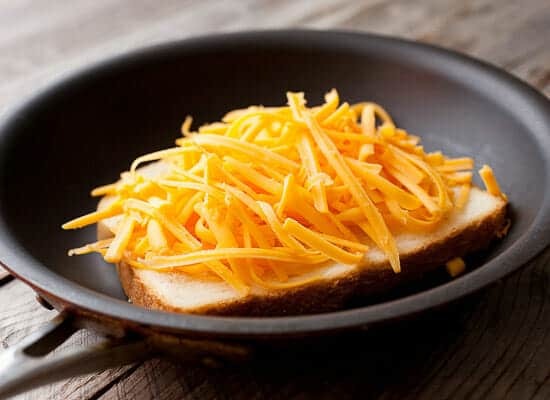 Don’t get in a hurry and cook it over high heat or your bread will toast way before your cheese is melted. It’s a fine balance, but one that you can do. Gooey cheese is what you want! So here is the fun step that I wasn’t sure would work. When your sandwich is done or almost done, give it a very light coat of butter again. When I say light, I mean as light as you can butter something. You just want to make sure the cheese can stick to the bread. 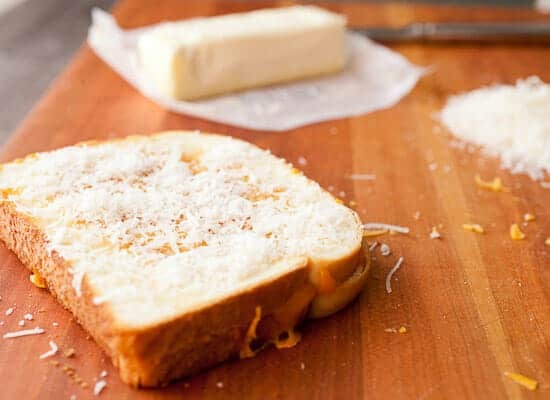 Then cover the bread entirely with grated Parmesan cheese. It’s really important to use a hard cheese for this step. Something like romano or parmesan works best. Then you flip the sandwich over so the parmesan is in direct contact with the hot pan. At this point crank up the heat and cook the sandwich for about two minutes. 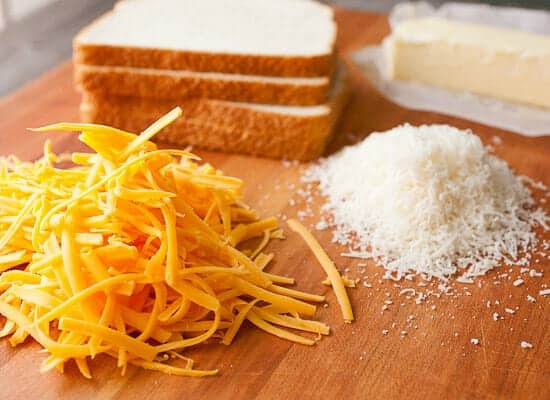 While the sandwich cooks one the first side, add the same amount of Parmesan to the top of the sandwich. Flip it and cook it for another minute or two on the second side. 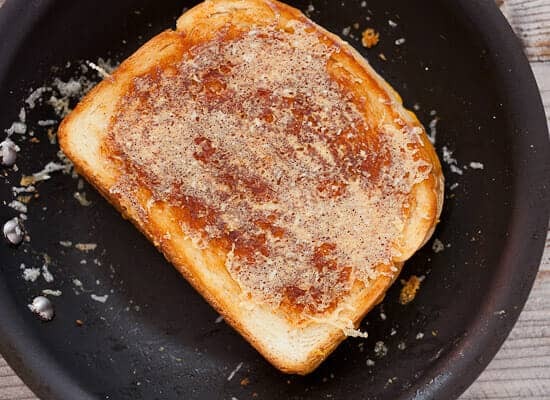 Because of the high heat and nonstick pan, the Parmesan will melt, stick to the bread, and then immediately start to get really crispy. Slice it. Serve it. Eat it! For a sandwich with four ingredients, this one is pretty hard to beat. This sucker was super-fun to make and even more fun to eat! Spread the word. 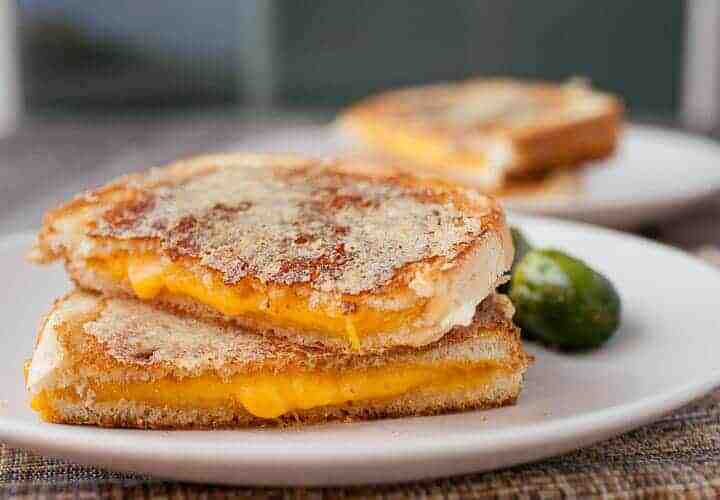 The Inside Out Grilled Cheese is a thing. I think I just drooled on my keyboard. I’m trying this tonight! Very yummy. We use mayo for the buttering part. Since I use the olive oil mayo, saves some calories. sounds weird, right? Also- I HIGHLY recommend you trying Gruyere cheese in place of the cheddar. It’s amazing. yes, crunchy cheese is the bomb! That looks pretty damn good to me. Love the cheese mixture! This looks so amazing! I wonder if it would work with a well seasoned cast-iron pan, we swapped all our non-stick for cast iron, so far so good. Next time I make a grilled cheese, trying your way! I made one in my cast iron skillet and it worked like a charm. I also always add some garlic salt or garlic powder (depending on how “health conscious” I’m feeling) to the original butter spread and it’s delicious! YUM YUM… and YUM! I’ll just have to make this one next time I pull together a roasted tomato soup. Thanks for sharing! One question… when they create those crisps for salad, I’m guessing they use something like a bacon press to get them to come out flat? I’ve made them a couple of times for soup garnishes, and you really just have to make a thin layer of parmesan on a pan, and bake it until it is crispy, but not burnt. If you have a silpat, it really helps to get them off the pan, otherwise, they can get really sticky/stuck. Ohhh, I love this! And suddenly I want to try grilling all of my sandwiches with cheese on the outside… I’m thinking provolone/pesto/tomato would work pretty well too. Mmm. « Easy Chicken Sheet Pan Supper Recipes Home » Izeafest!